Audrey has fallen on hard times. Her husband disappeared under mysterious circumstances, and she has since lived on the hope that he'd return home. When Audrey receives an unexpected letter, supposedly written by her husband, she becomes determined to find the truth behind his disappearance. Explore 30 enigmatic locations- an old cemetery, a provincial town, an artist studio- to help Audrey in her quest. 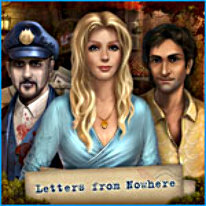 Meet eccentric characters and find clues in the mysterious letters. Who knows what's behind an ordinary letter from nowhere?